3 Oreos, orange slices in a 'present' muffin cup, raisins, pepperoni on a gingerbread pick, cheesy star sandwich with carrot santa hat. Really loving the eyeball picks I found on final Halloween clearance - they certainly make food fun! In other news, yesterday was my 2 year blogiversary! Hard to believe I've been going now for 2 years. It's been fun, and I've enjoyed 'meeting' so many blogging friends. To see more fun ideas of lunches for kids, check out Muffin Tin Mom. Congratulations on your 2 years! May you have many, many more happy blogging years. The lunch is adorable and looks mighty tasty! Happy Anniversary! I love this lunch! The eyeball pick is so cute! Yay!! Congratulations on blogging 2 years. Your Muffin Tin Mondays are way too cute! I love this bento box. 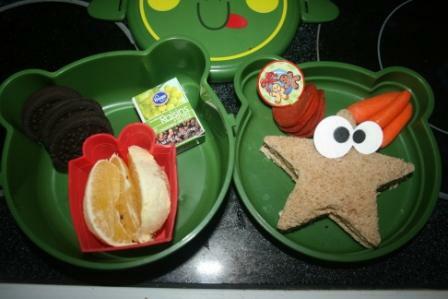 I wish Deaglan would sandwiches because I'm certain I could mimic you with these cute star shaped sandwiches. Sigh. He refuses bread. Congrats on 2 years! Love the eyes! Ha I love the star sandwich! Di you just do that with a violent cutter? Congrats as well on the two year anniversary of your blog! And I might add-YOU know how to make food fun! Cute lunch! I would be proud to eat those meals--even push my kids out of the way to do it. happy 2 yr blogiversary!!! yippee!!! so happy to have known you for more than a year now!!! My boys said they are coming for lunch. Very cute. Those eyeball picks are awesome! Congrats on your 2 year bloggiversary! Congrats Lisa! Those are the cutest, I love the star! Thank you for stopping by and your sweet comments, they meant a lot to me! Love the eyeball picks too!! I always enjoy these posts because it gives me such great ideas for lunches for my kiddos!!! Happy blogiversary!! 2 years goes by quick, doesn't it?? OH MY! Adorable oreo eyes! I will have to try this! UMM That Cheesy star sandwich is the best! I think my husband would love it LOL- New follower love that star. Won't you please pack my lunch for me Lisa? I bet Pierce's lunches are the envy of his fellow classmates! Happy Aniversary. You sure have a lot of followers for only 2 years. Ok. I kinda want you to come make my lunches. I mean, a star sandwich is way cool, but with eyes! You are a genius! Congratulations on your anniversary. I love the eye picks. I agree, the eyeball picks make food fun, and alive! so cute! Happy Anniversary! I have met so many wonderful blog friends here...including you! He must just love his Bento box treats every week. Very cute! Congratulations on two years!!! Such a cute lunch. I definitely need some eyeball picks. Congats on 2 years!! Awesome. And those muffin tins are fantastic! from sitting in the lunchroom a lot I often wondered if parents knew what there kids threw away. This is a good trick and a lovely lunch to eat. Hey stranger! Cute MTM! You are so creative!! Love the pics from your posts! Kiddos are still so cute! Tulley has the same problem as ours did/does.. only guess what... lost ours from last year. I put it somewhere so I would remember where it was.. so I could bring it out early and guess what!?! He must have really went back to the North Pole cause he is no where to be found!! This must be as much fun to make as it is to eat. Now I want an orange. Oh wow congratulations on two years of blogging!! That's awesome!! Love those eyes on the star sandwich. Very cute! Love the star sandwich, those eyes are too cute. Your meal is adorable! Love the star sandwich! I adore your creativity with their lunches!